Hello and welcome back to another fun day of blog hopping with The Twinery and Skipping Stones Design. If you have come from Lindsay Amrhein's blog, you are in the right place. If you just happened upon this post and would like to participate, hop on over to The Twinery Blog to get the details and get started. So, have you been inspired with the awesome projects so far?? It was so fun to combine product from these two companies to make this card. I used the Grunge stamp set from Skipping Stones Design and Honeydew bakers twine from The Twinery. The cardstock is stamped with the awesome Grunge stamps and I used some of the Honeydew twine to stitch along the border of the two stamped papers. The sentiment is from SRM Stickers and I tied it to the card with some more of the yummy Honeydew bakers twine. The nuts are cut from the Robot party cartridge and my Cricut onto some metallic cardstock from DCWV. The deadline for leaving comments is 11:59pm EDT, Friday May 25th. Be sure to check out the blog hop post over on The Twinery Blog for all the details. Winner will be announced on The Twinery Blog Sunday, May 27th. Now, hop on over to Katie Gehring's blog to see what she has created with this awesome combination. I absolutely love this! You've totally made me want to pull out this set and use it again! what a great way to use the twine! AWESOME card...I love the design! OK, this might be my favorite card. I love how different it is and how much depth and texture it is. So very cool. Masculine cards don't come naturally to me, but you knocked it out of the park! 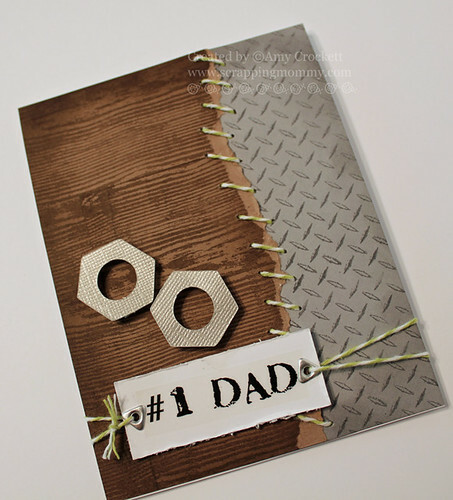 Such a great card with the perfect masculine touch...the twine is a perfect complement! love it! perfect for fathers day! thanks for this giveaway & i'm glad i found your blog! 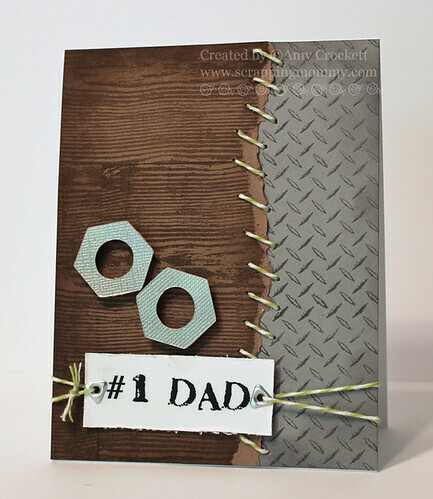 Amy ~ COOL Father's Day card or manly card! GREAT papers too! I LOVE the new look to your blog as well! What a fabby job of a masculine card!!!!! LOVe how you used grunge!!! great idea, I never thought of it..... hope I can have all the colors! Great card! LOVE the over-sized twine stitching! Perfect father's day crd. I just might lift this one for my son's first father's day. Great card...love the metal detail. I LOVE everything about this card Amy!!! How Cool is this this is the perfect card for a Man and Boy. love the layering and embossing. thanks for sharing and the chance to win. Excellent use of Grunge! Awesome card. I totally love this card! Love how you used the Grunge stamp set! Great card. I alway have such a gard time making guy cards. Amazing card...beautifully done..thanks for inspiring!!! What an awesome "man" card! I would never have guessed that the papers were stamped. I may have to give the grunge set a second look. And I love the way you laced the two sides together with the twine. I like your use of twine on a masculine card...always a challenge. you keep amazing me!! This is such a great card! Great card! I love this combination. I love this card. Wonderful idea for a man! Thank you for sharing. This is wonderful inspiration for a masculine card!! TFS and for the chance to win! Love this card!! Father's Day is set! Seriously awesome card! I love it! Masculine cards are so difficult for me to make and this one is just perfect! Love this card, perfect manly card for father's day! And the use of the twine, awesome! Amy, it's beautiful, love it!